That Brant County Sound! 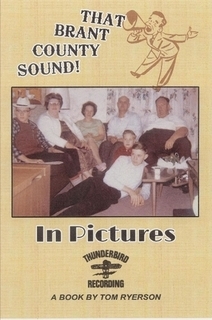 In Pictures provides readers and fans of Canadian Country Music the photographic heritage of Brant County, with snapshots of Terry Sumsion, Roger Quick, Jan Stevens, Fred H. W. McKenna, the Mercey Brothers, Dave Souliere, Terry Carisse, Marilynne Caswell, Marie Bottrell, Charlie Louvin, Don Oatman, Michelle Wright, and Whisky Hollow. Similarly, one can find pictures from a broad range of years, giving readers a glimpse into the careers and families of the performers who signed with Jim or were associated with those who signed with him. It even includes an early shot of Eilleen Twain, who went on to become famous as Shania Twain. The book is very much about the country music industry, though, and not about the musicians’ private lives. Most of the images are from live performances, promotional photos, or television appearances, with some being snapshots of the Thunderbird record covers or newspaper clippings. The author’s scope for the project is broad and ambitious, and this photographic companion delivers on this, showing images of singing contests and impromptu jam sessions along with Jim’s grandparents, mother, aunt, wife, and cousins. There are also recent photos of the places in some of the promotional photos, as the author traces these locations and what became of them. There is a lack of storyline in this volume, though, and only those deeply familiar with the Brant Country music legacy will be able to follow who the people in the pictures are. There are references to some of the stories found in the other volume, but it is very much a companion, so one may want to read them side-by-side so that the color images and black-and-white photos can enrich the lengthy narrative found in the other work. The captions in this book can also pose a challenge, as the performers, though often listed left to right, can be very hard to identify, as some people stand in front of others in the shots and thus the “left-to-right” can be muddied by figuring out who is more left or more right than the other. And some of the photos seem to struggle with how they were compiled, as a number of them are persistently dogged by “flash glare marks” in the same corner, as though the digitizing technique were to blame in some way. The photos provide the context for the Brant County music story, helping give readers an added flavor of who these performers were, how they interacted with others, and what sort of music they played. One can almost hear the county twang as it leaps off the pages from the guitars, mandolins, drums, and other instruments of these musicians, page after page.